Once again, it looks like Wall Street is quite comfortable with Netflix's aggressive spending strategy. Netflix (NFLX - Get Report) faced a high bar going into latest earnings report, and did a pretty good job of clearing it. The streaming giant posted impressive subscriber growth in its first-quarter earnings report, and also beat earnings and revenue expectations. The positive news yielded a big pop in Netflix shares: They're up 6.76% in premarket trading on Tuesday to to $328.59, putting them within $5 of an all-time high reached in March. All told, shares of the streaming giant have gained more than 60% so far this year. Subscriber growth expectations were high going into earnings, and Netflix managed to exceed them. In Q1, 5.46 million international and 1.96 million U.S. subscribers were added. That topped guidance of 4.9 million and 1.45 million, respectively, and was also above year-ago subscriber adds of 1.42 million and 3.53 million. 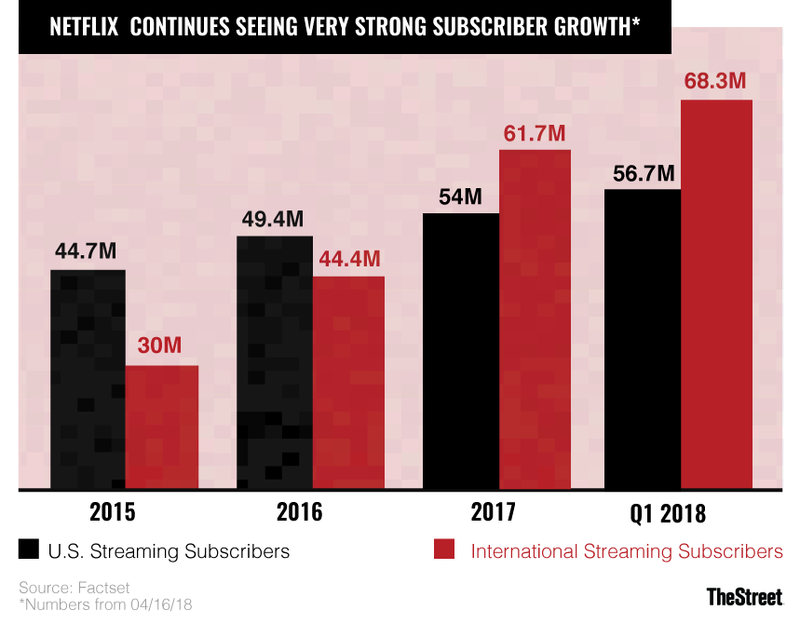 Growth is forecast to slow a bit in Q2, but still remain strong: Netflix is guiding for 1.2 million U.S. and 5 million international net subscriber adds, above consensus estimates of 973,000 and 4.27 million, respectively. With the company having easily beaten its subscriber guidance the last two quarters, it's possible that the Q2 guidance is a little conservative. Netflix ended Q1 with 125 million global streaming subs, and expects to end Q2 with over 131 million. The value of that kind of scale, whether in terms of financing a giant content budget, creating buzz around popular originals and making a variety of content bets aimed at different regional and niche audiences pay off, can't be overstated. In addition to 25% subscriber growth, Netflix's Q1 revenue got a boost from a 14% increase in average selling price (ASP). That's up from Q4's 9% ASP growth, and is the result of both price hikes and the popularity of Netflix's more expensive HD and 4K plans. Rising 4K TV penetration rates, together with Netflix's steadily-growing library of 4K content, could help drive further ASP growth in developed markets. Though it was hiked twice before, Netflix for now is keeping its 2018 content budget at $7.5 billion to $8 billion on a profit-and-loss basis (cash spending will likely be higher). Likewise, its full-year free cash flow (FCF) guidance remains unchanged for now at negative $3 billion to negative $4 billion. It wouldn't be shocking if Netflix hiked its content budget again between now and year's end, to better position itself ahead of the 2019 launch of a Disney (DIS - Get Report) -branded streaming service. Though their exact impact isn't broken out, it looks like Netflix's bundling deals with carriers and pay-TV providers such as T-Mobile (TMUS - Get Report) and SFR Altice is providing some lift to subscriber growth. And though the deals feature discounts relative to Netflix's retail pricing, they don't seem to be doing too much ASP damage. Recent deals with Sky and Action Alerts PLUS holding Comcast (CMCSA - Get Report) could provide a lift to Q2 subscriber adds. Netflix predicts it will remain "free cash flow negative for several more years," as it makes giant content bets, invests heavily in marketing and generally remains in land-grab mode in large international markets where its penetration rates remain well below its near-50% U.S. level. This outlook suggests Netflix will continue burning cash for longer than some analysts had expected, given that analysts polled by FactSet had modeled 2021 FCF of $679 million. But as has been the case for a while, it looks like Wall Street remains quite comfortable with Netflix's aggressive spending strategy. TheStreet's Eric Jhonsa also covered Netflix's Q1 report and earnings interview through a live blog. TheStreet's Executive Editor Brian Sozzi shares a live analysis of the Netflix results below.